Multiple AppleInsider readers reached out on Tuesday to reveal the silent update added by Apple. 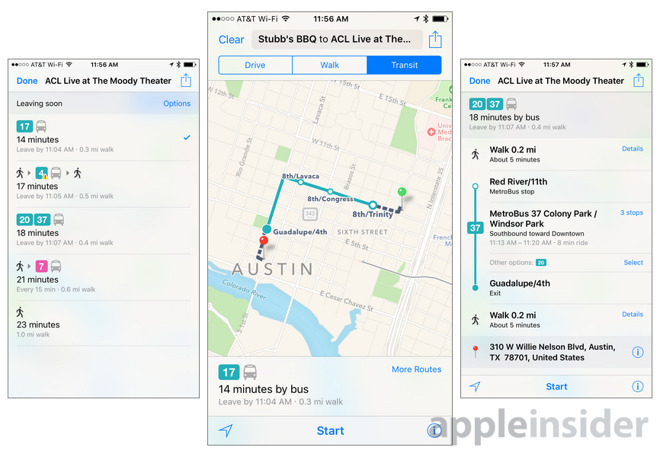 Austin marks the first added city since Apple launched transit directions in Los Angeles, Calif., last December. SXSW 2016 kicks off this Friday in Austin, and runs through March 20. In terms of city availability, data remains extremely limited in Apple Maps when compared to competitors such as Google Maps. When it launched with iOS 9 last year, Apple Maps transit was available in Baltimore, Berlin, Chicago, London, Mexico City, New York City, Philadelphia, San Francisco, Toronto, Washington D.C., and 30 cities in China, including Beijing, Shanghai and Shenzhen. Maps were also added to Boston and Sydney in October.